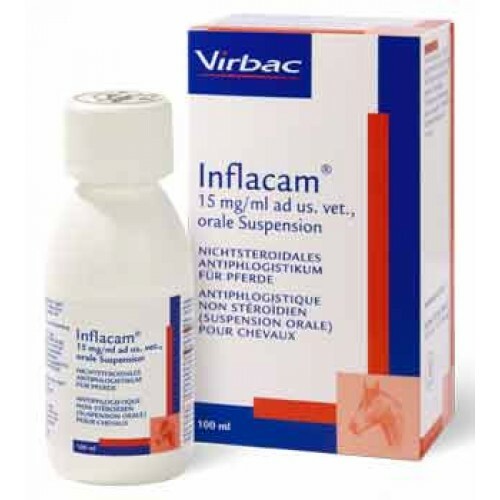 Inflacam Oral Suspension for Horses; Oral suspension for the alleviation of inflammation and relief of pain in both acute and chronic musculo-skeletal disorders in horses. Oral suspension; White to off-white viscous oral suspension. Do not use in horses suffering from gastrointestinal disorders such as irritation and haemorrhage, impaired hepatic, cardiac or renal function and haemorrhagic disorders. Isolated cases of adverse reactions typically associated with NSAIDs were observed in clinical trials (slight urticaria, diarrhoea). Symptoms were reversible. In very rare cases loss of appetite, lethargy, abdominal pain and colitis have been reported. In very rare cases anaphylactoid reactions which may be serious (including fatal) may occur and should be treated symptomatically. Laboratory studies in cattle have not provided any evidence for teratogenic, foetotoxic, or maternotoxic effects. However, no data have been generated in horses. Therefore the use in this species is not recommended during pregnancy and lactation. Do not administer concurrently with glucocorticoids, other non-steroidal anti-inflammatory drugs or with anti-coagulant agents. Meat and offal: 3 days. Pharmacotherapeutic group: Anti-inflammatory and Anti-rheumatic products, non-steroids (oxicams). Meloxicam is a non-steroidal anti-inflammatory drug (NSAID) of the oxicam class which acts by inhibition of prostaglandin synthesis, thereby exerting anti-inflammatory, analgesic, anti-exudative and antipyretic effects. It reduces leukocyte infiltration into the inflamed tissue. To a minor extent it also inhibits collagen-induced thrombocyte aggregation. Meloxicam also has anti-endotoxic properties because it has been shown to inhibit production of thromboxane B2 induced by intravenous E. coli endotoxin administration in calves and pigs. When the product is used according to the recommended dosage regime, the oral bioavailability is approximately 98%. Maximal plasma concentrations are obtained after approximately 2–3 hours. The accumulation factor of 1.08 suggests that meloxicam does not accumulate when administered daily. Approximately 98% of meloxicam is bound to plasma proteins. The volume of distribution is 0.12 l/kg. The metabolism is qualitatively similar in rats, mini-pigs, humans, cattle and pigs, although quantitatively there are differences. The major metabolites found in all species were the 5-hydroxy- and 5-carboxy- metabolites and the oxalyl- metabolite. The metabolism in horses was not investigated. All major metabolites have been shown to be pharmacologically inactive. Meloxicam is eliminated with a terminal half-life of 7.7 hours. To be administered either mixed with food or directly into the mouth at a dosage of 0.6 mg/kg body weight, once daily, up to 14 days. In case the product is mixed with food, it should be added to a small quantity of food, prior to feeding. The suspension should be given using the Inflacam measuring syringe provided in the package. The syringe fits onto the bottle and has a 2 ml scale. Shake well before use. After administration of the veterinary medicinal product, close the bottle by replacing the cap, wash the measuring syringe with warm water and let it dry. Avoid introduction of contamination during use.